Do you want to make better profits? Making bigger profits is no longer enough. The Social Finance Forum is about making better ones. It’s the leading event in Canada for professionals who believe that business should be about more than making money – it should be a powerful force for good. Social finance uses the power of business to drive progress. It’s a movement of entrepreneurs, innovators and investors who are creating ventures that tackle tough social problems in ways that can be self-financing and sustainable. Having started as a niche approach, social finance is growing rapidly. It is firmly established in the UK and US, and quickly gaining popularity in Canada as investors and business owners seek to create meaning with their money. 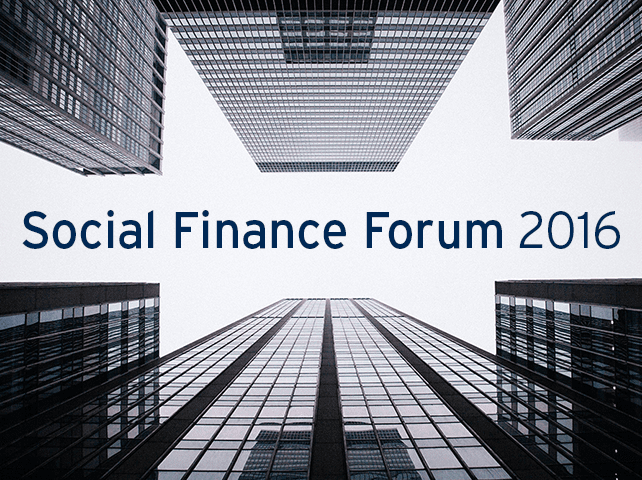 With the field poised to become part of the mainstream financial system in Canada, Social Finance Forum 2016 will bring together more than 40 speakers and 400 participants to share their insights on the challenges and opportunities that lie ahead. Tomicah Tillemann is a former State Department advisor to Hillary Clinton who is now helping reshape global finance as director of New America’s Bretton Woods II project. He will deliver the conference keynote address. Tomicah heads a team that uses deep analytics to make the case that social impact investing reduces economic volatility. For asset holders like pension and sovereign wealth funds that are too big to hide from market instability, the question shifts from why would they get into impact investing to why wouldn’t they? The man charged with running Bain Capital’s impact investing practice lends his insight to a panel discussion on where social finance is headed in the next decade. Early-bird saving: $250 discount on first 100 tickets sold.